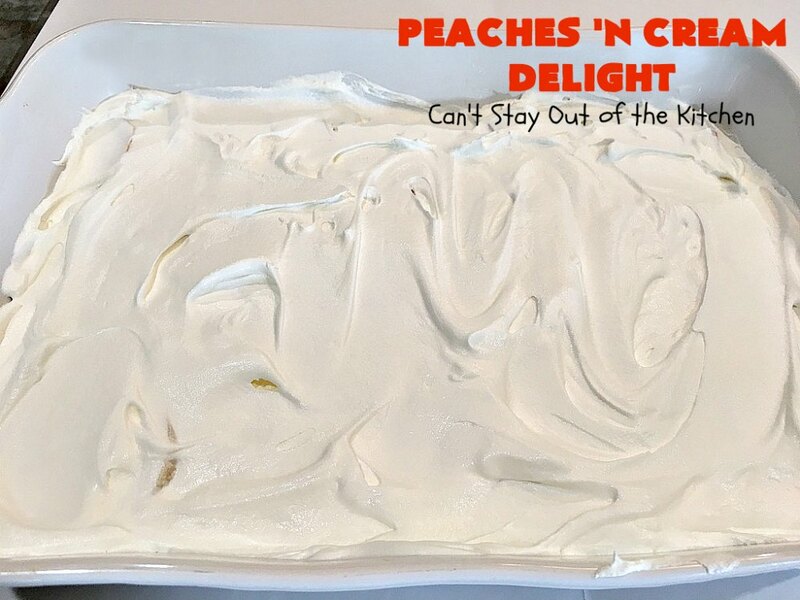 Peaches ‘n Cream Delight is heavenly. It’s a fluffy and creamy dessert that’s so mouthwatering. 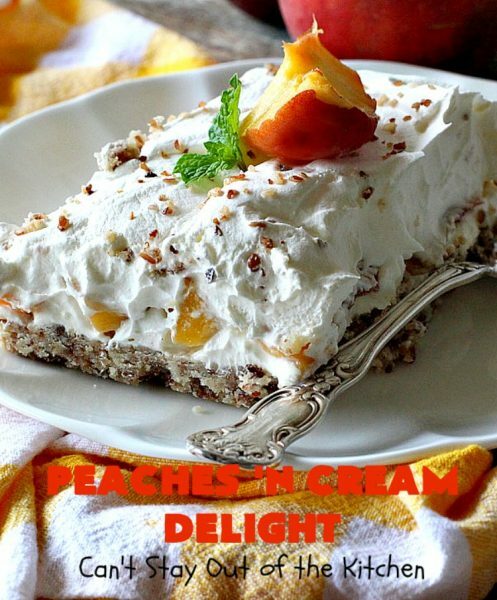 This luscious dessert has a bottom crust layer with pecans. The second layer is a cheesecake layer with powdered sugar, almond extract and non-dairy whipped topping. 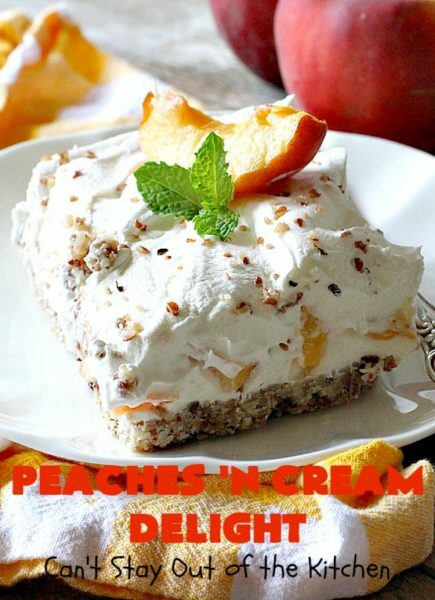 The third layer is peaches. While I used fresh peaches, you can also use canned peaches if you can’t locate fresh ones. Whichever way you go, this dessert is a humdinger! Back in August, I received a 20-pound box of fresh peaches from the Washington State Fruit Commission. These peaches were some of the most beautiful in appearance and delicious in taste I’ve ever eaten. The skin on these peaches was really smooth — almost like the skins on nectarines. Regardless, the peaches were awesome and incredibly delightful to the palate. I made a ton of desserts with those peaches including Peach Chocolate Chip Blondies, Peach White Chocolate Chip Blondies and Peach Caramel Blondies. I also made Caramelized Peach Crumble Bars, Peach Upside Down Cake, Peach Crumb Coffee Cake, Peach Cobbler Cheesecake Brownies, and a Peach Slab Pie. All were so drool worthy. I served this delectable dessert for one of our Friday night care groups in September. It was very well received, probably because it’s one of those light and fluffy desserts you can’t stop eating. I highly recommend this lovely dessert for holidays, potlucks and company. Each pan makes at least 16 servings so it’s great to serve a crowd. 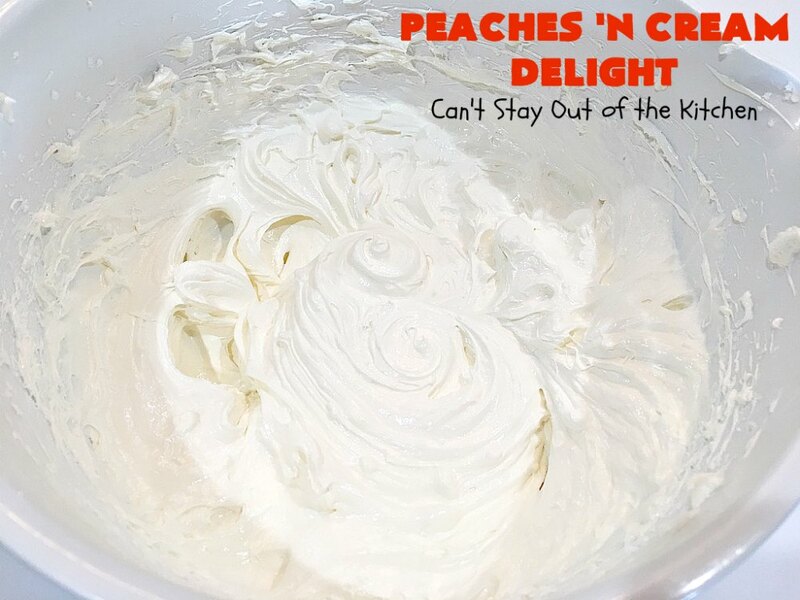 Peaches ‘n Cream Delight is so heavenly. This dessert is soft, fluffy and utterly delightful. 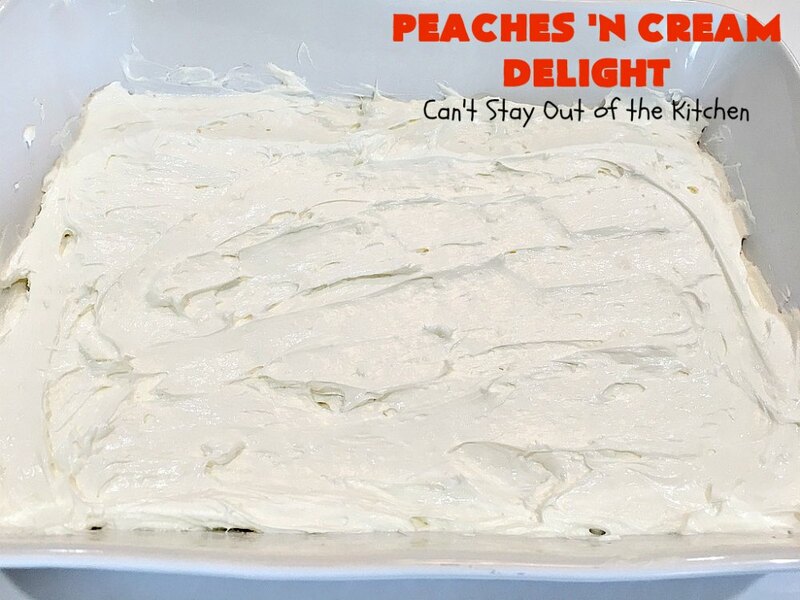 Peaches ‘n Cream Delight is a terrific dessert for company. I used these ingredients. 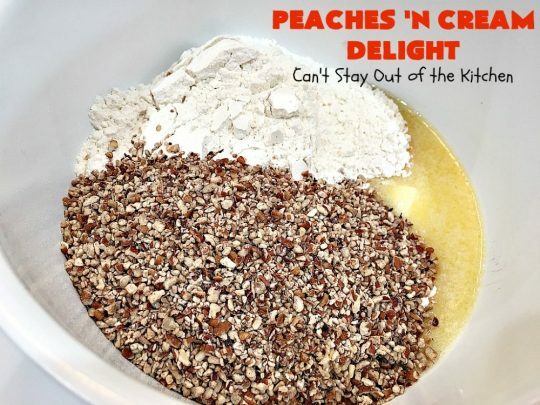 Add additional peaches if you want multiple layers of peaches. I recommend at least two or three layers of peaches. Melt butter. Add flour and pecans. 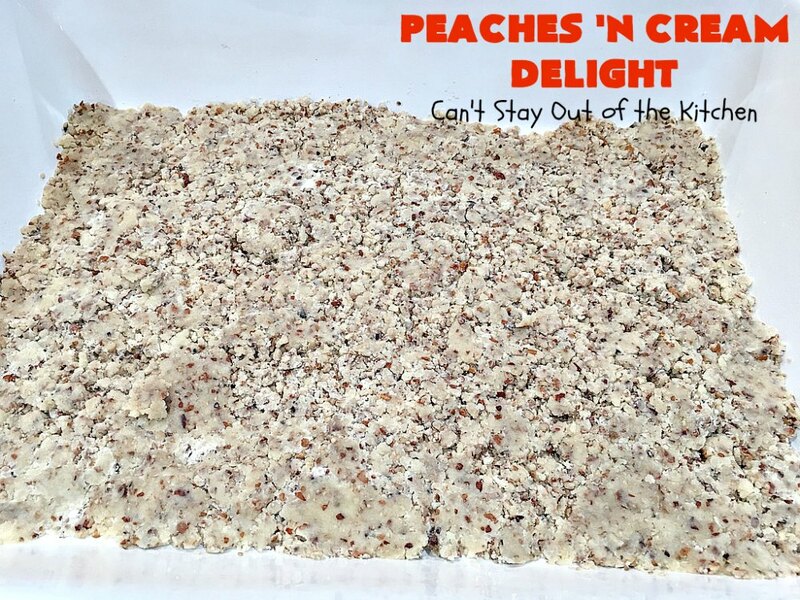 I used pecan chips, but this is probably better with coarsely chopped pecans instead. Stir ingredients with a fork to combine. Grease a 9×13″ baking dish. 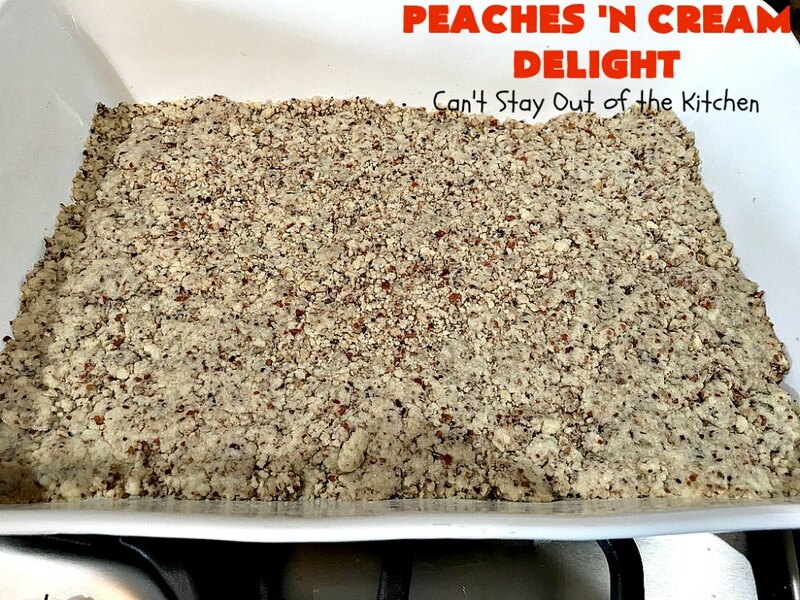 Spread crust mixture into baking dish. Bake at 350 for about 15 minutes. Remove from oven and cool completely before adding the next layer. In a mixing bowl, soften cream cheese. 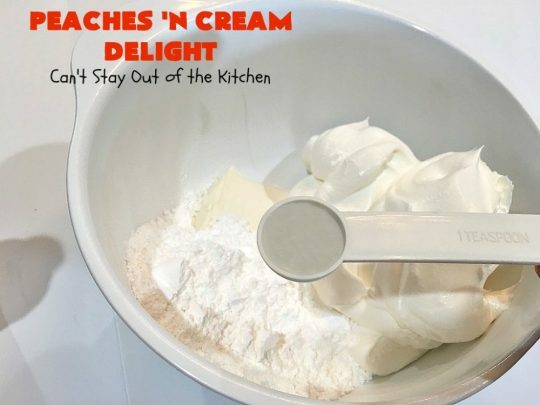 Add powdered sugar, non-dairy whipped cream and almond extract. Smooth cheesecake layer over top of cooled crust. Now layer peaches over top of the cheesecake layer. This is layer one of the peaches. 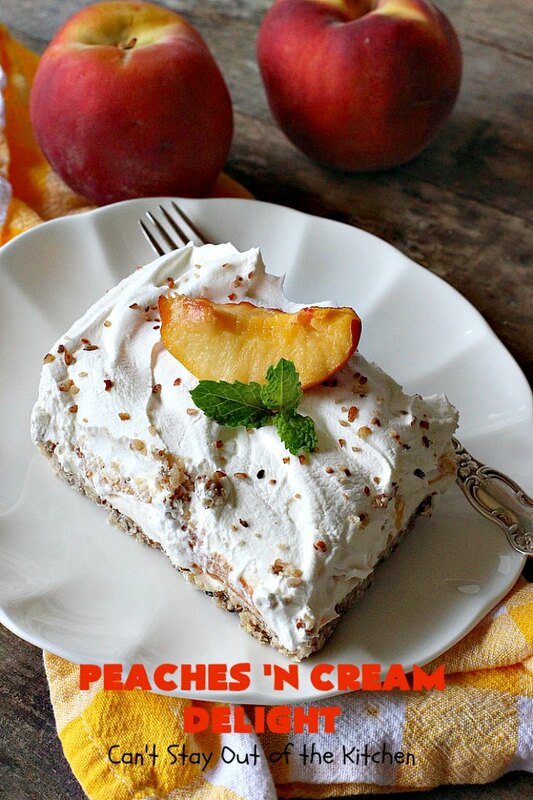 I recommend adding one or two more layers so the peaches really pop in flavor. 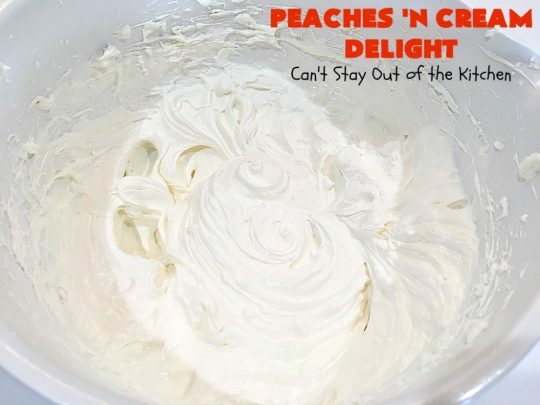 While I used fresh peaches, canned peaches can be substituted as well. Smooth remaining non-dairy whipped topping over top. 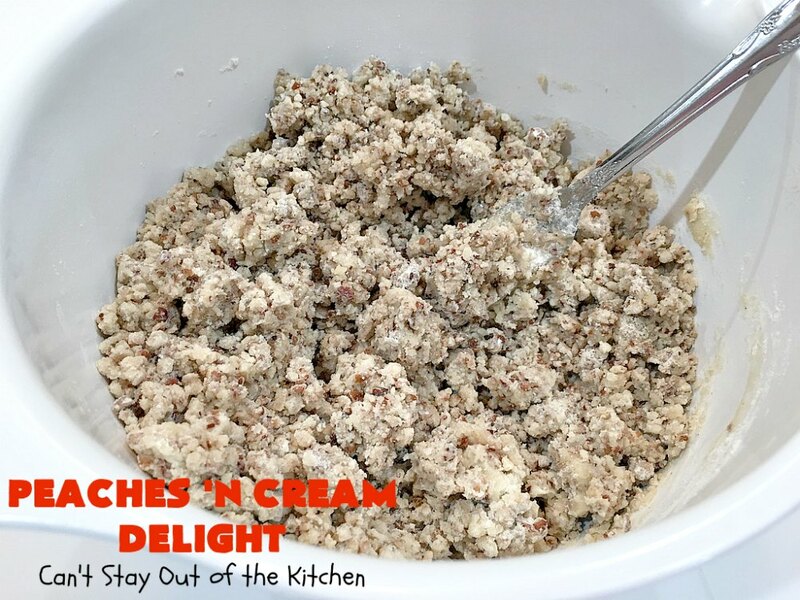 Sprinkle chopped pecans over top of whipped topping. Garnish with peach slices, if desired. This is the interior of the dessert. 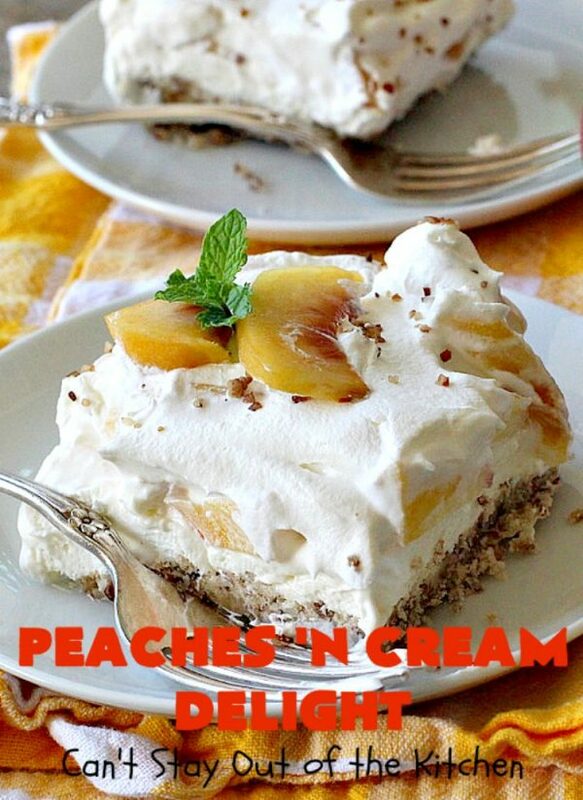 Peaches ‘n Cream Delight is a delightful cheesecake dessert with fresh peaches in the middle. If you enjoy peaches, this is the dessert for you! This delectable peach dessert is absolutely divine. 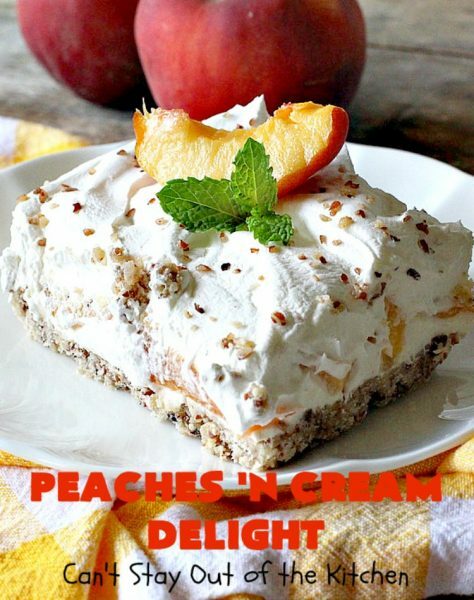 It's creamy, light and fluffy with a cheesecake layer and a fresh peach layer in the middle. 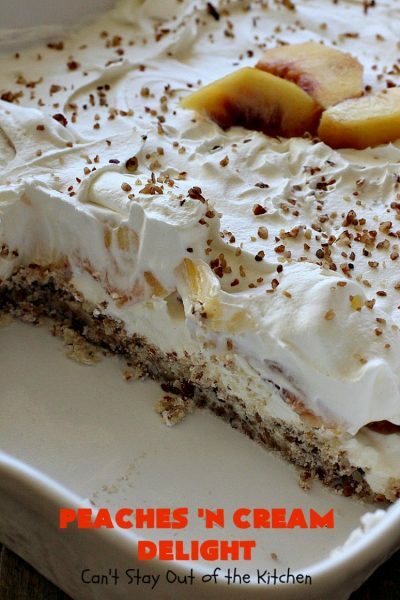 This is a wonderful dessert for holidays and company. 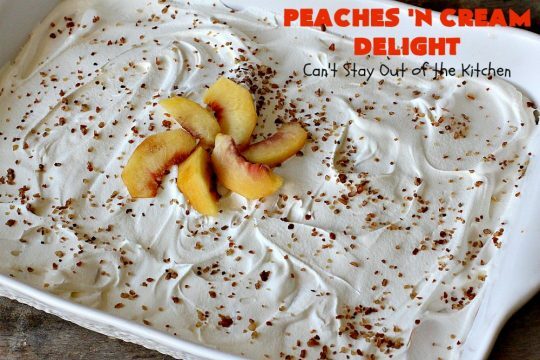 If fresh peaches aren't available, simply substitute canned peaches. Either way, it's sure to delight your family and satisfy any sweet tooth craving you may be experiencing. Spray a 9x13” baking dish with cooking spray. Combine ingredients in a medium mixing bowl. Press mixture very firmly into prepared baking dish. Bake at 350° for about 15 minutes. 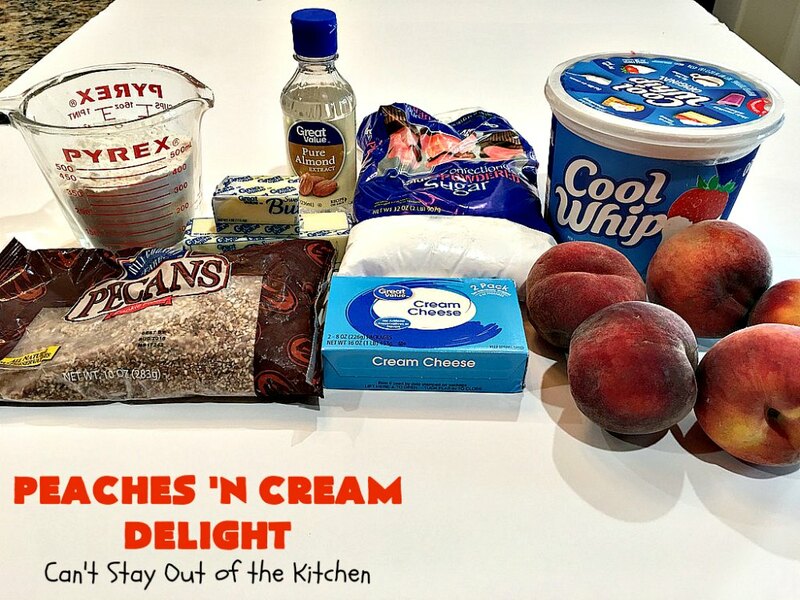 Slice peaches in 1/8” to ¼” slices. Place evenly over 2nd layer. 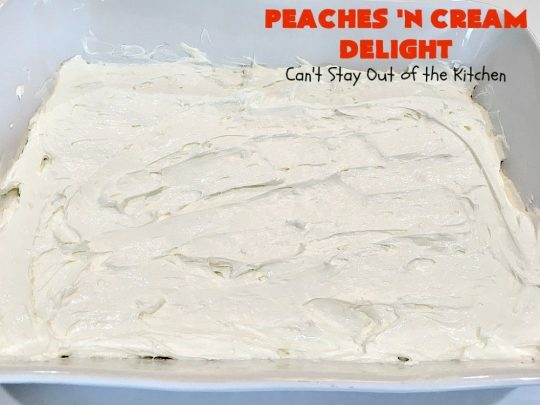 Add a second or third layer of peaches, if desired. Spread remaining cool whip over top of 3rd layer. Sprinkle with chopped pecans or walnuts. 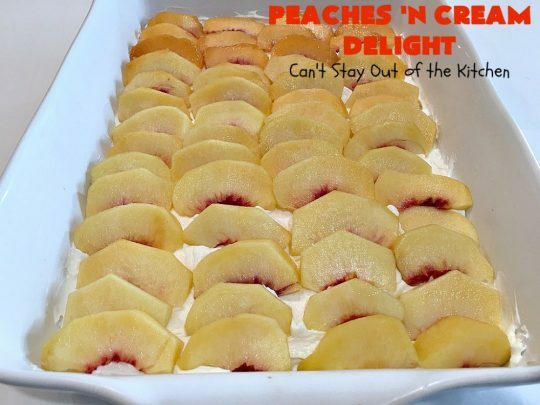 Place fresh peach slices over top, if desired. Cool 6 hours in refrigerator before serving, or freeze. Thaw 1 hour on counter before serving. NOTE: If I have to speed up the cooling process for layer one, I put it in the freezer after about 5-10 minutes and it will cool more quickly. Otherwise, it may take about an hour to cool completely at room temperature. NOTE: You can substitute canned peaches if fresh peaches are not available. The peaches need to be rinsed, drained and patted dry. You will probably need about 4 to 6 29-oz. cans. 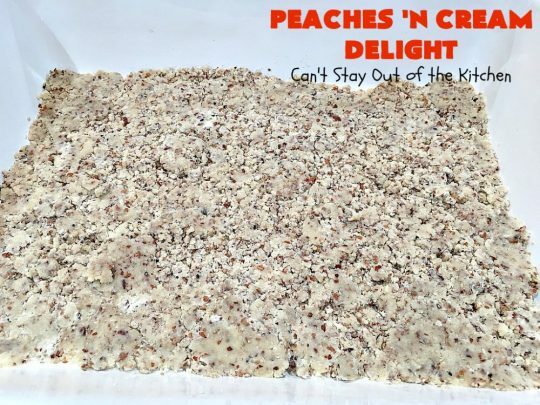 NOTE: While I used pecan chips (which are extremely finely chopped pecans), I recommend using coarsely chopped pecans instead. Peaches courtesy of Washington State Fruit Commission. 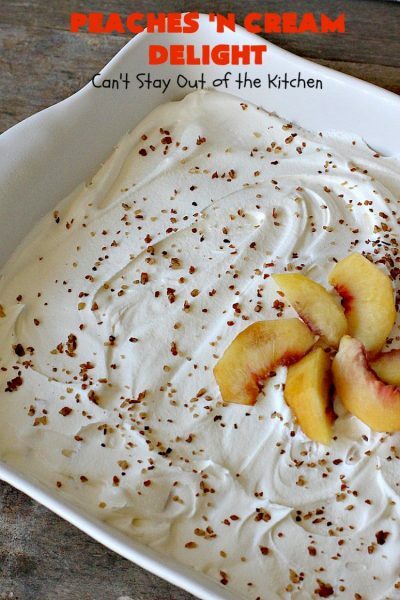 Peaches really shine in this dessert. I recommend two or three layers of peaches for the ultimate peach experience. We enjoyed this creamy, fluffy dessert. You may also enjoy these delicious recipes.